This entry was posted on December 29, 2015 at 12:25 am and is filed under Drama, Mystery, Thriller, Western with tags 2015. You can follow any responses to this entry through the RSS 2.0 feed. You can leave a response, or trackback from your own site. 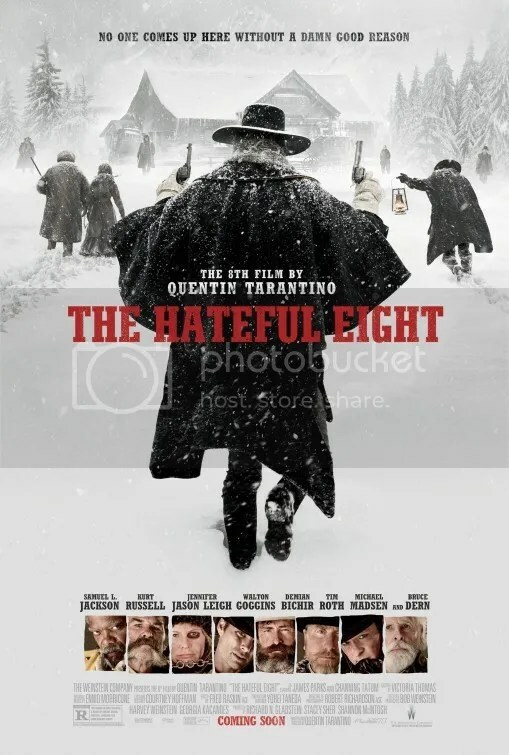 I will watch it very soon as i am an ardent fan of Quentin Tarantino’s work. Thanks for the information you have provided. Nice review man. Sorry you didn’t take much to this. I pretty much worship all of Quentin Tarantino’s work and hope to watch The Hateful Eight over the weekend in 70 mm. Great review. 🙂 Damn! Sounds like a major disappointment. I was really looking forward to this! Now I can’t be bothered to go to it. If you are truly an ardent fan of Quentin Tarantino’s work, then you should enjoy it. All others beware! Awesome review and background to the film. I was excited to hear Ennio Morricone scored the film. Yes one of the lone bright spots. Always enjoy his scores. I’ll take Reservoir Dogs over this any day. Dogs was twice the entertainment but at only half the length. The Hateful Eight was unbearably long. Let me know what you think of the film. I hope my review still charms you even if you enjoy the film. I consider that the highest praise actually. I pretty much agree with you here. The 70mm screening I saw didn’t stop or break but there were some focusing issues. Shooting it in 70mm was pretty pointless though and not a likeable character to root for, although I guess it’s supposed to be Samuel Jackson and/or Walton Goggins, but the script didn’t give us enough to hang our hats on. True. Walton Goggins is probably the most likeable. It sort of makes me want to check out The Shield and Justified – the TV shows he’s known for. Tarantino films are too violent for me but I read your review with interest. It’s the first negative one I’ve read on the film. I certainly have no desire to see this one. Although mostly positve, the film has earned more unfavorable reviews than anything Quentin has done since the “Death Proof” segment in Grindhouse. The Wall Street Journal’s “Warmed-Over Spaghetti” review was even more scathing than mine. Ugh, why are all these movies like 3 hours long. I noticed in your review of The Revenant you noted the running time as well, and I think b/c it’ll involve the likes of Leo and Hardy I won’t be as affected by the length, even though that’s still a really long time to sit still. For things like this, I don’t know. That just seems . . . indulgent. I didn’t feel the 2h 36m runtime of The Revenant the way I did with this movie. I guess I just enjoyed that experience more. A LOT more. Then again The Hateful Eight is over 3 hours. Way too long. Ugh. Every conversation took forever. Of course, there is no sign of anything positive. Just negative, hateful people. Nobody to cheer for. 2 stars. I saw the movie yesterday, and it seems like you really don’t like Terentino’s sense of humor. I think most people do, so your movie review is much more biased than, what I assume, the others you’ve written. To everyone else, this movie was one of Terentino’s funniest, and although it starts off slow, when the action starts, it doesn’t stop. Not one of Terentino’s best, but it was a good movie. Im curious how you know most people like Tarrantino’s sense of humor? Was there a study? Did it include the whole world? But you’re right. I don’t like Quentin Tarantino’s sense of humor. Of course I’m biased! That’s the whole point of my reviews or any film critic’s reviews for that matter. We all have preferences and partialities that accrue over our lifetimes and become embedded in our judgment of anything new. To prefer mashed potatoes over french fries is a bias. P.S. I loved Inglourious Basterds. Thankfully not one, but two theaters here in Boston were able to show Hateful Eight in glorious 70mm, with trained professionals at the helm. Being able to see the film in the format he intended really amped up the experience for me from the digital cut I watched before voting in BOFCA’s awards. There’s so much depth and texture not there in DCP. The movie is filthy and nasty, loaded with despicable characters, but I loved it. Sad to hear you didn’t. I can understand your gripes with the movie. I found the tension/build up in the first section to be fun and interesting, especially in how it zeroes in on post-Civil War racial tensions that I think are scarily relevant today. I enjoyed the interplay between the characters and the whodunnit taking shape for Samuel L. Jackson’s character to solve. Using only a single location added to the paranoia and tension between the characters. For me things moved quickly and the three hours flew by. The only section I felt was unnecessary was the one explaining how people got to the cabin. Yeah I think that re-cap was for the benefit of people who came back after an intermission. Still wasn’t necessary, but I think he was trying to be cute.